January 28 we launched DiskDetective with a first batch of about 32,000 sources to classify. Of these, 20,000 have been in rotation at any given time. That’s a lot of astronomical data–and a lot of flipbooks to look at. Well, it completely shocked us when we heard in March that some folks were seeing repeats–meaning that they had already classified more than 20,000 subjects! Now, we had always planned to have many more subjects than that in Disk Detective. But at that point, we were still in the process of downloading the data from the NASA/IPAC Infrared Science Archive onto a hard drive on Marc’s living room carpet, a process that took about a month. So we weren’t ready to put any more data online to keep all our detectives detecting. But now we are ready. I’m excited to say that we’re adding about 272,000 more subjects to Disk Detective, a massive data blast that will probably keep us all busy until well into 2017. The new subjects will start rotating in to everybody’s queue today, bit by bit. Thank you for all your hard work that led us to this day! Now, this next batch of data will be a bit different than the batch you’ve already been working on in two important ways. First of all, the first batch of data came mostly from the Galactic poles (To be precise, they came from regions with Galactic latitude +50 to +90, +30 to +40, and -40 to -90.) The new data fill in the rest of the missing regions–right in the middle of the Milky Way (as illustrated crudely to the right). Debris disks are located at all Galactic latitudes. But most YSO disks are located in the Galactic plane, i.e. at Galactic latitudes less than about 30 degrees. So as we dip into this new data, we’ll start seeing more YSO disks like Herbig Ae disks and T Tauri disks. We might even see some transitional disks: massive gas disks with big central holes, thought to be in partway between YSO disks and debris disks. Also, as we look closer to the Galactic plane, the kinds of contamination will change. The plane of the Milky Way is chock full of interstellar dust clouds, as the image on the right shows. Beware, some of those clouds may have patterns in them that mimic the appearance of our disk candidates! Second of all, for this new batch of data, we’ve removed many of the fainter objects, specifically, all objects with J magnitude > 14.5. (Remember, higher magnitudes mean fainter objects.) Here’s why. 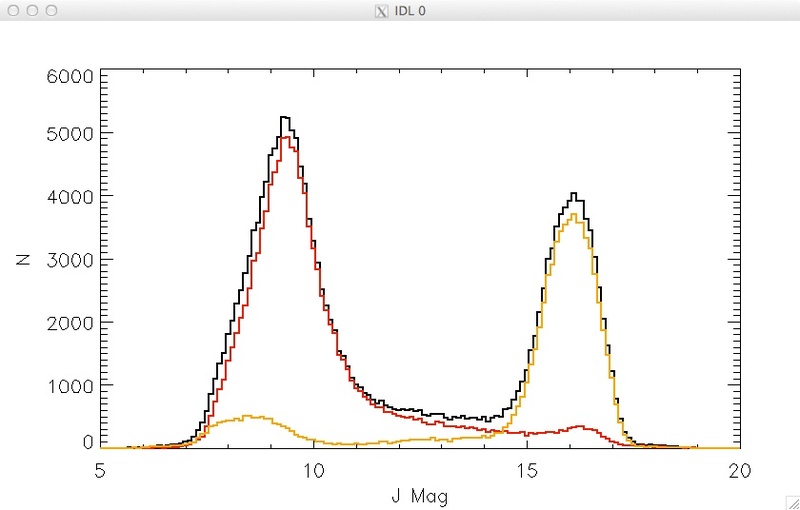 The figure below shows the distribution of the J magnitudes of the sources with excess emission at 22 microns that WISE made really high quality images of (specifically ones from Southern Galactic latitudes, but that doesn’t matter). The total distribution, shown by the black curve, has two peaks, one around J=9, the other around J=16. What is the meaning of these two peaks? Could it be two different kinds of sources? The red and orange curves tell the rest of the story. The red curve shows the numbers for just those sources close to the Galactic plane. The orange curve shows the numbers for the remainder of the sources–those far from the galactic plane. Dividing the sources up in this manner shows that the second peak is mostly due to distant galaxies. At low galactic latitude, dust from our Galaxy, the Milky Way, obscures most galaxies external to our own. So we know that the objects shown by the red curve–most of the peak at J=9–are stars (and maybe stars with disks). At high galactic latitude, the opposite is true. The objects shown by the orange curve should be mostly galaxies. That’s the peak at J=16. For now, we’d like to skip the objects that are mostly galaxies (orange curve) and concentrate on the objects that are mostly stars (red curve). The orange and red curves cross at about J=14.5, so we decided to put aside the objects with J > 14.5 for now. That means this new batch of data should have fewer galaxies in it than the old batch–and more of those delicious disks! What are we doing with the sources with J magnitude >14.5? Don’t worry, we’ll be putting them to good use. Our colleagues have suggested that hidden among those fainter sources could be Kardashev Type II and Type III civilizations. So once we’re done with this new batch of sources (roughly in 2017), we’ll start looking at the fainter objects–looking for signs of extraterrestrial intelligence. In fact–you may have already spotted some in the first batch of data. (They look just like debris disks and very red galaxies). Stay tuned!